The Military Commissions for trying alleged al-Qaeda terrorists always had the risk of becoming Kafkaesque kangaroo courts with little credibility among people around the world, a danger that has become more and more acute as the process moves forward, Marjorie Cohn writes. It is a bedrock principle of our system of justice that everyone who is charged with a crime is presumed innocent unless and until proven guilty. That includes “high-value detainees” awaiting trial in GuantÃ¡namo’s military commissions. Yet pre-trial hearings held June 17-21 in the cases of five men charged with planning the 9/11 attacks revealed a clear presumption of guilt on the part of the government. Some of the original detainees jailed at the Guantanamo Bay prison. The issues litigated in the hearings included undue influence exerted on the military commission by political leaders, defects in the charging process, government violation of the attorney-client privilege, the right of the accused to exculpatory evidence in the hands of the International Committee of the Red Cross, and the exclusion of the accused from some pre-trial hearings. Judge James Pohl, who presides over these cases, took the motions under advisement. That means he postponed ruling on them until later. Although one defendant filed a motion to prevent the government from force-feeding him, that motion was not heard. Defense attorneys argued that high government officials exerted undue influence on the charging of their clients. The Military Commissions Act (MCA) expressly prohibits “any person” from unlawfully influencing or coercing the action of a military commission. Yet top U.S. officials proclaimed the guilt of some of the defendants before they were charged and their cases set for trial in the military commissions. President George W. Bush made more than 30 public statements directly implicating Khalid Shaikh Mohammad in the 9/11 attacks; some of Bush’s statements also named Ramzi bin al Shaibah and Mustafa Ahmed Adam al Hawsawi. Defense Secretary Donald Rumsfeld and White House Press Secretary Ari Fleischer made similar statements. President Barack Obama, Vice President Joe Biden, and Attorney General Eric Holder referred to the defendants as “terrorists.” Holder named all five defendants as “9/11 conspirators.” Obama and White House Press Secretary Robert Gibbs specifically referred to Mohammad, as did Sens. John McCain, R-Arizona, and Lindsey Graham, R-South Carolina. The guilt of the defendants, all of whom face the death penalty, was pre-determined. The Sixth Amendment to the Constitution assures the right to effective assistance of counsel when the government is considering whether to pursue the death penalty. Yet the period preceding the formal charging of these defendants was replete with insurmountable obstacles to “learned counsel,” making their assignment meaningless. Under the MCA, defendants have the right to learned counsel, who are learned in applicable law relating to capital cases, to ensure defendants are effectively represented. But several roadblocks to their representation rendered their assignment mere window-dressing. Because professionals known as “mitigation specialists” were also denied security clearances, they, too, could not meet with the accused to assist in the gathering of information the defense could submit to prevent their clients from being charged with the death penalty. Thus, counsel were stymied in their efforts to effectively communicate with their clients about their detention, interrogation and torture by the U.S. government, life history, current and past mental statuses, current location of their family, and the whereabouts of any educational, medical, or other records. In addition, prison authorities established a “privilege team” to screen items prisoners could have in their cells to prevent their possession of “informational contraband”(which is given such a broad definition it could include media reports on efforts to close GuantÃ¡namo). But the review team includes intelligence agents, and they need not keep the information confidential. Lawyers are forbidden from talking about “historical perspectives or [having] discussions of jihadist activities” or “information about current or former detention personnel” with their clients. Thus, Mohammad’s lawyer cannot ask his client why he may have plotted against the United States or who might have tortured him in the CIA black sites. Al Baluchi’s attorney is precluded from comparing his client’s alleged role in the offense with conspirators in other acts of terrorism who have and have not faced the death penalty. This is a serious interference with the defendant’s ability to present a defense. The International Committee of the Red Cross (ICRC) is an independent, neutral and impartial humanitarian organization. The Geneva Conventions contain a mandate for the ICRC to provide protection and assistance to victims of armed conflict and other situations of violence. ICRC’s confidential information must be kept confidential. All recipients of ICRC reports, including U.S. authorities, are obligated to protect and abide by ICRC’s confidentiality. They are precluded from disclosing any confidential information in judicial or other legal proceedings. 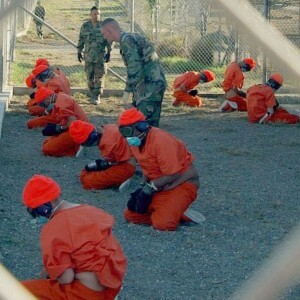 Since 2002, the ICRC has visited detainees at GuantÃ¡namo. The ICRC engages in a confidential dialogue with the government about the conditions of confinement at GuantÃ¡namo. It also engages in confidential private interviews with detainees. The ICRC maintains its access, and its status of neutrality, because it guarantees confidentiality. But the ICRC can decide to turn over some of its material at its discretion. There is a tension between the ICRC’s insistence on confidentiality, the government’s security concerns and the defendants’ right to exculpatory evidence under the Due Process Clause. The Supreme Court ruled in Brady v. Maryland that prosecutors must disclose materially exculpatory evidence in the government’s possession to the defense. That includes any evidence that goes toward negating a defendant’s guilt, that would reduce a defendant’s potential sentence, or evidence bearing on the credibility of a witness. Moreover, defense counsel argued that since this is a death case, there should be more favorable procedures for the defense. The prospect of an execution, without full disclosure of mitigating evidence, would shock a foreign government as much, if not more than, the provision of ICRC materials. Defense counsel objected to the exclusion of their clients during closed pretrial proceedings. The prosecution maintained that defendants must be excluded from hearings in which classified material is discussed. The Military Commissions Act guarantees the right of the accused to be present at all hearings unless he is disruptive or during deliberations. The defense argued that defendants should be allowed to attend hearings in which classified information is discussed, if the information came from the accused himself. For example, Mohammad’s attorney wants his client to be present when they discuss his torture. The government waterboarded Mohammad 183 times at the CIA black site. Hearings were held from which the accused were excluded. Learned counsel for Hawsawi filed a motion to prevent the government from force-feeding his client, or in the alternative, to be notified in advance and given an opportunity to be heard before any force-feeding is employed. Hawsawi has been participating in the hunger strike at GuantÃ¡namo, but has not yet been force-fed. His counsel argued that “Mr. Hawsawi has been peacefully protesting by refusing food, on and off, for months now. Given his slender build and already relatively low body weight, it is entirely plausible that forced feeding is imminent.” This motion was not argued at the hearings because the judge found it premature, as Hawsawi is not being force-fed yet. 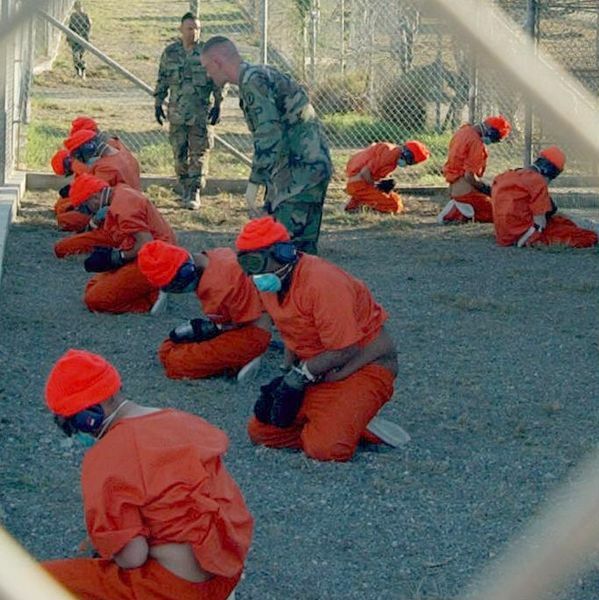 Of the 166 detainees remaining at GuantÃ¡namo, 104 are participating in the hunger strike, and 44 are being force-fed. The written procedures refer to force-feeding as “re-feeding.” Although they contain a few redactions (material blacked out), the pages that describe the procedure for “re-feeding” are totally redacted. Boston University Professor George Annas, who co-authored a recent article in The New England Journal of Medicine, characterized the method of force-feeding being used on Democracy NOW!, as a “very violent type of force-feeding.” The American Medical Association and the World Medical Association have declared that force-feeding should not be used on a prisoner who is competent to refuse food. “[I]t is unjustifiable to engage in forced feeding of individuals contrary to their informed and voluntary refusal of such a measure. Moreover, hunger strikers should be protected from all forms of coercion, even more so when this is done through force and in some cases through physical violence. Four detainees filed a motion in a Washington D.C. federal court on June 30 to stop them from being force-fed and force-medicated with Reglan, a drug that can cause severe neurological disorders. Reprieve brought the motion on behalf of Shaker Aamer, Nabil Hadjarab, Ahmed Belbacha and Abu Wa’el Dhiab, all of whom have been cleared for release from Guantanamo. Trials in these cases will not begin before 2015. President Obama should halt all military commission proceedings and announce that the trials will be held in federal civilian courts, which have shown they are more than capable of prosecuting terrorism cases. As demonstrated in both this piece and the one I wrote about al Nashiri’s pretrial hearings, justice is impossible to achieve in military commissions, where guilt is a foregone conclusion. Welcome to Franz Kafka’s world brought to you by the league leader in terrorism aka the USA. I just watch Kafka and The Trial on YouTube. Wow!